Welcome to barefoot luxury on the beach of south Sri Lanka. Talalla resort offers an escape into their little paradise beach destination that has a panoramic view of the turquoise ocean, natural sea breezes, and incredible sunsets! Enjoy the relaxation and rejuvenation Talalla provides with their beach front spacious villas, outdoor pool, open air restaurant, spa, surf, and meals prepared from food grown in their own garden! Founded by Australian Laurie Rose who fell in love with the spiritual charm of Sri Lanka. 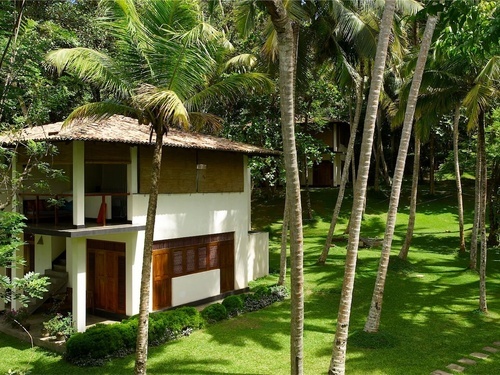 She decided to build a resort that was tucked into the corner of the mile long Talalla beach, which is, for the most part, a newly built fishing village. Talalla had barely begun construction when the village was devastated by the 2004 tsunami. Many of thier staff are tsunami victims and the resort has been accepted as a part of the village and is one of its biggest benefactors. They also work hard to ensure their environmental footprint is minimized and that the local community benefit economically from the resort and any subsequent tourism in the area. They encourage their guests to enjoy the natural abundance through the open air villas, and provide information to raise awareness of local and environmental issues.